Christopher Columbus birthplace, and Italy's largest port. Genoa is the capital of Liguria and the sixth largest city in Italy with a population of 588 688 within its administrative limits on a land area of 243.6 km2 (94 sq mi). The urban area called Genoa Metropolitan City has an official population of 862,885. Over 1.5 million people live in the Genoa Metropolitan Area. 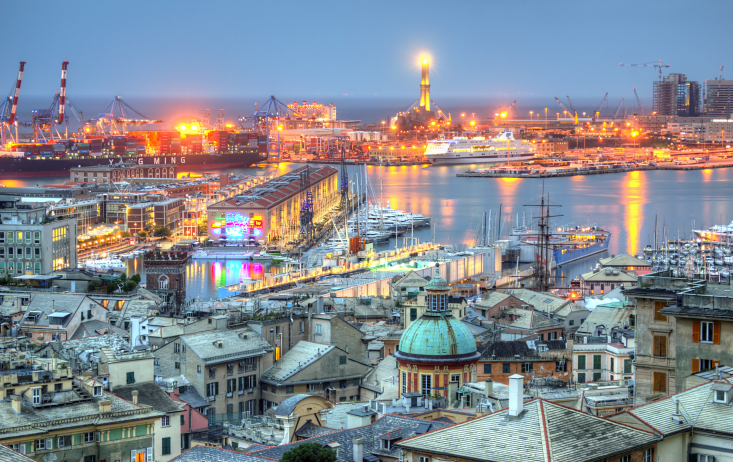 Genoa is one of Europe’s largest cities on the Mediterranean Sea and the largest seaport in Italy. Genoa has been nicknamed la Superba (“the Proud one”) due to its glorious past and impressive landmarks. Part of the old town of Genoa was inscribed on the World Heritage List (UNESCO) in 2006. The city’s rich cultural history in notably its art, music and cuisine allowed it to become the 2004 European Capital of Culture. It is the birthplace of Christopher Columbus and Niccolò Paganini. Strada Nuova (now Via Garibaldi), in the old city, was inscribed on the World Heritage List in 2006. This district was designed in the mid-16th century to accommodate Mannerist palaces of the city’s most eminent families, including Palazzo Rosso (now a museum), Palazzo Bianco, Palazzo Grimaldi and Palazzo Reale. Palazzo Bianco and Palazzo Rosso are also known as Musei di Strada Nuova. The famous art college is also located on this street. Other landmarks of the city include Palazzo del Principe, the Old Harbour (Porto Antico), transformed into a mall by architect Renzo Piano, and the famous cemetery of Staglieno, renowned for its monuments and statues, in which the mortal remains of several known personalities rest, among them Giuseppe Mazzini, Fabrizio De André and Oscar Wilde’s wife, Constance Lloyd. The Edoardo Chiossone Museum of Oriental Art has one of the largest collections of Oriental art in Europe. Genoa also has a large aquarium located in the above-mentioned old harbour. The port of Genoa also contains an ancient lighthouse, called “La Lanterna”. The old harbour (“porto antico” in Italian) is the ancient part of the port of Genoa. Renzo Piano redeveloped the area for public access, restoring the historical buildings (like the Cotton warehouses) and creating new landmarks like the Aquarium, the Bigo and recently the “Bolla” (the Sphere). The main touristic attractions of this area are the famous Aquarium and the Museum of the Sea (MuMA). In 2007 these attracted almost 1.7 million visitors. The city of Genoa during its long history at least since 9th century had been defended by different line of walls. To this day, large portions of these walls remain, and Genoa has more and longer walls than any other city in Italy. The main city walls are known as “Ninth century walls”, “Barbarossa Walls” (12th century), “Fourteenth century walls”, “Sixteenth century walls” and “New Walls” (“Mura Nuove” in Italian), the more imposing, built in the first half of 17th century on the ridge of hills around the city, having a length of almost 20 km (12 mi). Some fortresses stand along the perimeter of the “New Walls” or close them. Arranging a private jet charter to and from Genoa Cristoforo Colombo airport (LIMJ / GOA) is straightforward. Genoa airport lies approximately 7 kilometres from the city centre and takes around 15 minutes by car subject to traffic. A private jet charter from London to Genoa airport will take approximately 1 hour 45-50 minutes in a 6 seat Cessna Citation CJ2 jet, and 1hour 35-40 minutes in a 8 seat Cessna Citation XLS jet. Arranging a private jet charter or helicopter transfer with Freedom Air to arrive in style to Genoa is simple. The Freedom Air team can be reached on +44 (0) 1275 548001 to book your next trip.